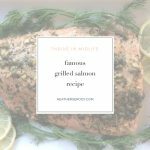 This famous salmon recipe started the Famous Recipe series due to its popularity in my kitchen and then on Pinterest, where it's been pinned over 25,000 way more times than I can count. When people taste this salmon they kinda freak out. Truly. 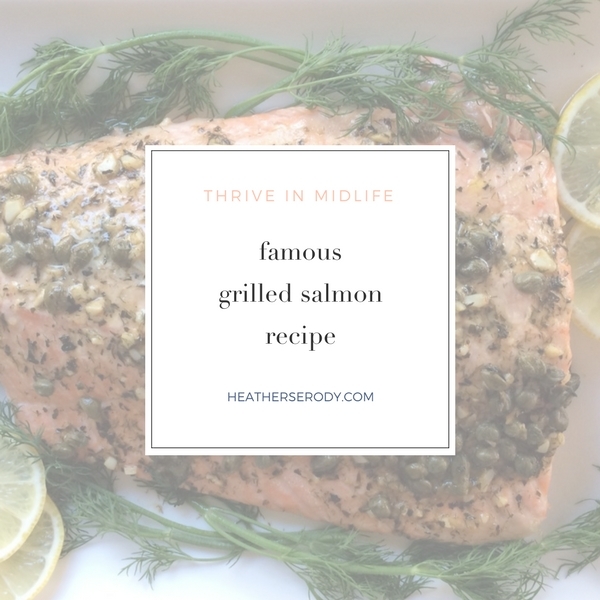 I knew this recipe was awesome because often friends would tell me their kids really don't like salmon that much, and not to make too much when I'm having them over for dinner. The look on the parent's faces is priceless when those kids usually clean their plate and then ask for a second helping. I've refined this recipe from the original to cut down the prep time to just 5 minutes and so that you don't have to dirty but one bowl to make the entire thing. It tastes better using convenient dried herbs – really! It comes out perfectly every time. Even people who believe they hate salmon love this recipe. It won First Prize for the most shared salmon recipe on social media for 2014 from the Eater's Choice Awards. Light grill or preheat oven to 375º F.
Place salmon skin-side down in heavy-duty foil with sides turned up and allow it to come to room temperature (about 20 minutes). Combine all ingredients, except salmon, in a small bowl. Whisk together and then pour over salmon. Place foil on medium hot grill and cover with lid for =/- 20 minutes OR place foil on a cookie sheet a roast in a 375º F oven for about 20 minutes. Salmon is ready when the edges are caramelized and center is just cooked and fish is light and flakey. The skin should remain attached to the foil when salmon is lifted with a spatula. It seems the best things in life come from friends. Thanks to my dear friend Alicia P. for graciously sharing this recipe with me many years ago, this recipe is my adaptation. I still think of her generous spirit, warm hospitality, our friendship every time I make it. Thanks for stopping by and trying out this recipe! The macros are for 1/4 of a 2 lb. raw fillet of salmon. Your serving size is 1/4 of the cooked fillet, which will be between 6-8 oz. (because the fillet loses water weight during cooking). I hope that helps! just came across ur site not sure if ur still around i’m type 2 diabetic i like keeping a track of what and how much i eat . ur nutrition fact say 1/4 fillet fish how much is that in ounces? Hi, Kans — there is a recurring incompatibility with this recipe plugin that I have used across my site. When my website updated, my recipes no longer were showing up. Long story short, I’ve patched a short term fix here so you can get the recipe now. Thanks so much for your patience and readership! And I hope you enjoy the salmon! i can’t seem to get this recipe. can anyone help? i would love to try it. thanks. @lisaelliott79 WordPress had an upgrade that was not compatible with the zip list recipe function causing havoc. All is well now & happy Easter!! What happened to the recipe? I have made this several times & LOVE it, but can’t find the recipe anymore & it’s missing from this post!!! I was going to make this tomorrow for Easter. Now what do I do?!?! I found this recipe on Pinterest and have made it many times since. Just delicious!! Great salmon recipe. I baked mine and it turned out flakey, tender, and juicy. While the capers provided a nice salty element, we found this needed some savory/Unami flavor….so I drizzled some soy sauce over the top. Thank you! I cooked the fish in the oven and just poured the ingredients over after whisking them together. It was delicious! I’ll have to try grilling it and following your method next time. Hi, Jennifer! I think it’s worth the effort to simmer the sauce on the stovetop before you pour it over the fish so that you are cooking the garlic a bit and the flavors have a chance to blend together and the sauce emulsify. Keep in mind once you pour the sauce over the fish, it’s just heated indirectly from the bottom (if you are grilling it), which is the cooking method I recommend because it imparts a slightly smokey flavor. If you are pressed for time and baking it in the oven, it will still turn out fine if you don’t simmer the sauce first. Just whisk it together very well and mince the garlic instead of chopping it if you’re doing it this way. Why do you cook the olive oil and seasonings? I only had extra virgin olive oil so I just whisked the ingredients together and poured it over the salmon. I’m just wondering how it changes things to cook it cook it beforehand. Delicious!! Thanks for sharing! It’s still good with frozen salmon fillets. I had sautéed spinach as a side. This is the best fish recipe! My hubby and I both loved it! Would make this for company…it’s that good! This was delicious! I made it with tilapia, since that’s what I had on hand. My husband loved it too, which is a big deal, since he’s not a huge fan of fish. I’ll definitely make this again! This recipe is all over pinterest and yet no comments? I’ve made it twice and think it’s the best salmon I’ve ever made at home. Thanks for sharing. Delicious.